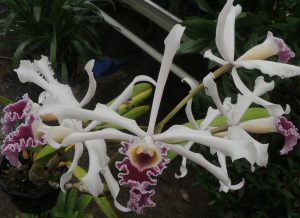 We have seen this large and dramatic orchid growing in cool Brazilian forests along the Rio del Flores in Rio State. Plants produce a single leaf 30cm long at the top of a ridged pseudobulb and flower spikes emerge as the bulb matures giving around 5-10 12cm wide attractively folded and ruffled flowers (hence the name). The flowers are long lasting if kept dry and in common with related species look upwards for their pollinator and so are worth dropping down when in flower so you can enjoy the best view of the dark lip. We have seen the plant growing high in trees at around 1000m and so give it cool bright conditions in Cool Americas (minimum 12C). 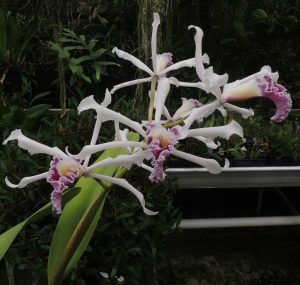 In common with many orchid species it flowers most abundantly when it can get its roots into some dead wood on its host tree and so responds well to feeding when in growth.